My Favorite Hoops I Have EVER Made! After a drought of hoop orders, I suddenly got five orders all around the same time. All of them needed new tape, so I had to place a HUGE tape order before I could get to the fun part of actually MAKING them. The tape arrived on Monday and I was like a child on Christmas day. 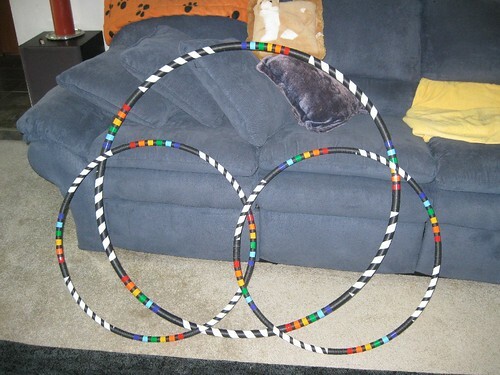 After giggling happily, tearing open the box and examining every roll of the largest hoop tape order I've ever gotten to make, I set about taping and spent the rest of the day making hoops. I made four hoops, and I got to do something new and unique with all of them. It was the happiest and most productive I've felt in a while. I truly, genuinely adore the process of making hoops. But these were a particular blast to make, because they had each been special requests, and I loved making them knowing that these hoops were each unique to the people who would soon own them. I LOVED, LOVED, LOVED the process of creating something special for very special people. I really hope I get to do this more often, because this kind of customization filled me with an incredible sense of joy and fulfillment. Since I'm the type of person who will leave the mashed potatoes on my plate for last because they are my favorite, I'm going to present these hoops to you in the same way. I love all of them, but I'm saving my favorite for last. I was excited about this color combination from the moment it was originally suggested. Blue, green, and brown. 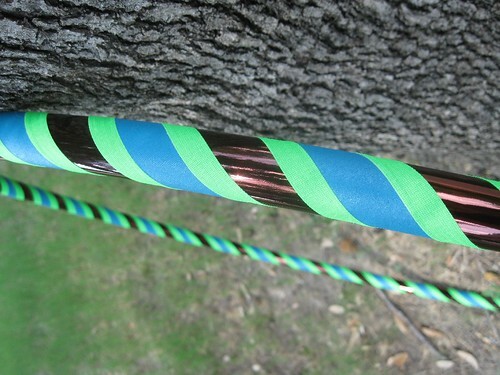 Normally, if I heard these colors suggested for a hoop, I'd go for the blue or the green as the shiny colors and the brown would be a grip. However, my tape supply was dwindling and I had to work with what I had. Luckily for me, I had a gorgeous metallic brown that I don't get to use very often, so I suggested the brown be the shiny and the blue and green be the grips. The result, I think, came out GORGEOUSLY (Is that a legitimate adverb? Because it is now.). As soon as I snapped pictures of it, I named it "Electric Chocolate", because that's what it looks like to me. Delicious chocolate infused with a zap of bright, electric color. Again, thanks to dwindling supplies, I had only one connector for a collapsible hoop. 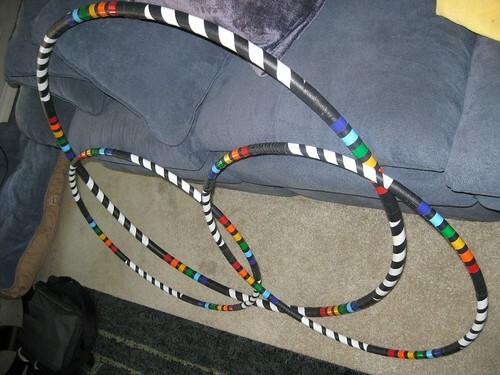 My original plan was to go ahead and make the hoop using the one connector (because I was having so much fun making hoops and I didn't want to let a silly thing like lacking connectors stop me), then when I got more, I would cut the hoop for the new connector, put it in, then trim the edges. 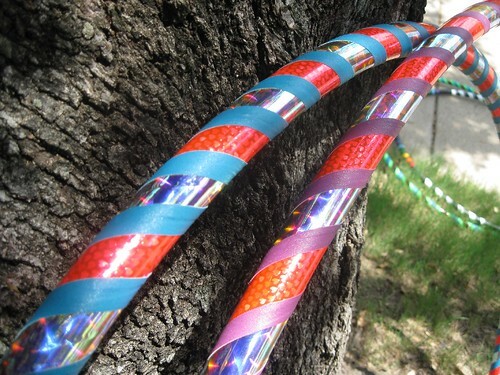 But after I'd finished taping, I remembered seeing a hoop one of my friends had that collapsed with only one connector and I decided to see if it would work with this hoop. IT DOES. 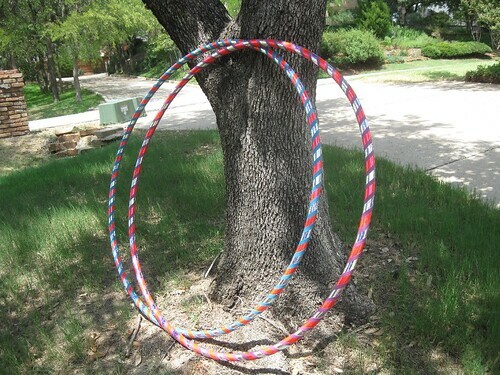 This is incredibly exciting to me, because in my opinion, it makes the hoop look nicer since it's not broken up in two places, and it also will help keep the collapsible hoops from forming a more oblong shape (as opposed to the circle they are supposed to be). Not only that, but I wouldn't have to wait for more connectors to deliver the hoop. It could be delivered as-is! 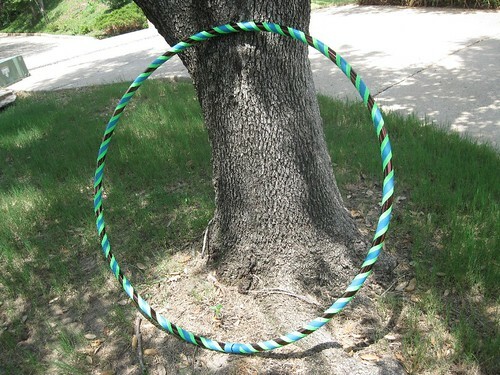 One of my friends and favorite clients came up to me at the weekly spin gathering we attend to ask me if I could make her a new hoop. She'd previously purchased the black and yellow hoop from this batch, named it Bumblebee, and proceeded to love it into a beautiful battered pulp. She wanted a new hoop, something special, pretty, slightly bigger, something shiny she could love and enjoy, a hoop to indulge in. I showed her my sample tape book, which has not only tapes I presently own, but also tapes that I can order if someone wants them. Among those tapes was a jaw-droppingly opulent holographic tape called "Fire Opal". In the sun, it refracts in the most incredible shades of pink, blue, magenta and orange. (The pictures of it on the hoops above DO NOT do this tape justice.) I've seen it on other hoops and have been dying to use it myself for ages, but it's a pretty pricey roll of tape. She saw it and immediately said, "That one. I have to have that one." She then proceeded to point a tape with little hearts on it, slightly raised from the metallic surface. "And that one." I don't normally make hoops with double shinies. And when I do, they don't usually have two super-special-fancy tapes like that. 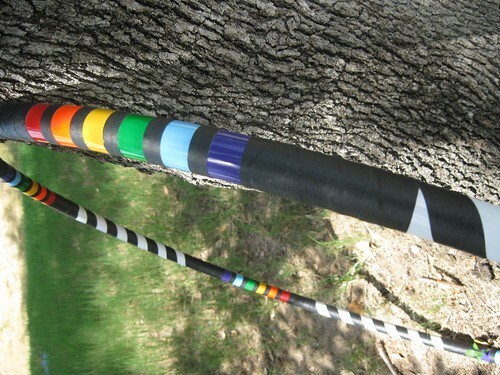 Nine times out of ten, when someone is ordering a hoop from me, they will pick a tape they like and when I tell them I'll have to order it, they drop it and work with what I have. They want their hoops quickly, and I don't blame them. Not this girl. I told her I'd have to order her chosen, and she said, "That's fine!" 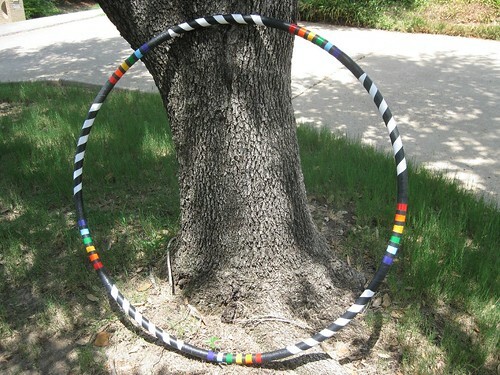 She also decided she wanted another hoop, with a different grip accent, for her friend. My initial instinct involved using metallic tapes for the colors and white and black for the grips. After mulling it over more, however, I remembered that the company I order my tape from had sent me samples of a high-gloss vinyl tape in solid colors. Colors that are bright, but also slick and shiny, like...GLASS. I was so excited about this idea that I went ahead and ordered a roll of tape in every color. I also wanted to capture the way the pipe had swirls, stripes, and solid chunks of black. I decided to try something I'd seen on other hoops but never tried before myself, making stripes of colors. The same day I got my tape, I also got a message from the girl who ordered the pipe hoop asking if I could also make her a set of minis in the same design theme. I said OF COURSE. I've never gotten to make a big hoop/minis matching set before! I made them the next day. When she came to pick up her hoops, she saw them and said, "Oh wow, they look just like my pipe!" I heard that and knew I'd done my job. Creating these hoops using a unique and creative inspiration, and attempting to make them look like the source material while still utilizing classic hoop designs, I felt like I got to truly be an artist. It may sound strange, given the limitation of having a specific model to work from. But that was oddly freeing. I could create the hoop however I wanted to, and the process of coming to the final result is the most fun I have ever had making something for someone else. I hope that this is not the last project I get to do that way. In fact, it would be thrilling to do nothing but super exclusive, incredibly customized orders from now on (though I love making hoops regardless of the amount of customization involved). I loved the uniqueness of this hoop, and more than that, it was a rush to know that it would be all the more special to the person that ordered it. Creating for others is a fantastic feeling. I think there is an extra thrill in making something as simple as a plastic circle into a magical work of art that lights up people's faces.